A much-needed part of the puzzle in place, at last! Great work. So, you weren’t content with being accused of being a racist; now you want to go for neo-Nazi. “during late antiquity, germanic tribes had of course migrated out of southern scandinavia”: the past is ever in flux. I’m currently reading a book that firmly denies that the Goths came from Scandi. A historian of the Dark Ages who I was rereading recently remarked that throughout history the Germans have been none too keen on the hard graft of clearing woodland, and preferred to purloin cleared woodland from their neighbours. What a wag, eh?? Remember that most of those “new towns” were actually already existing. E.g. Poznan, supposedly “founded” by Germans in 1253, is one of the oldest POlish towns. 1253 is the date when one of Polish princes (later king of Poland, IIRC it was Przemysl II) simply brought more German settlers, gave them new set of laws, and created new settlement near to already existing centre. 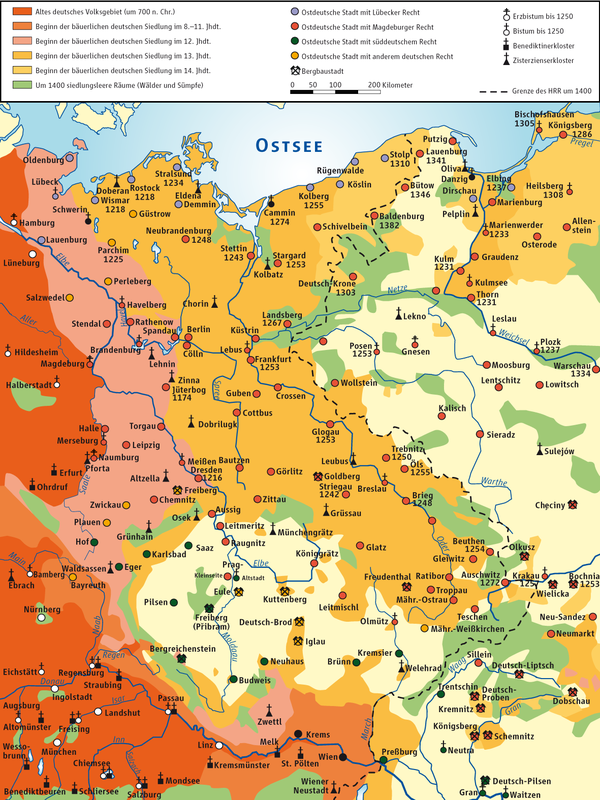 German historians tend to overestimate number of settlers and settlements during the ostsiedlung. That sentence would not normally be a verb-kicker, so it should be after the “wir” or we. The initial, sea-borne conquest of Britain by Germanic tribes was also a self-selection event. Interesting article. I was wondering when you were going to write about “die ostsiedlung”. A lot later than the medieval era, but another German-speaking people that migrated south-east into what is now Serbian Vojvodina. Not a lot of demographic information on them due to the expulsion following WWII, but many of them established colonies in Entre Rios province of Brazil. This is a great post, and a real treat as I had not expected you to post anything besides some Linkfests for the next few months, so thanks. I knew only a little about the Ostsiedlung so your post was very interesting and informative. A modern-day parallel might be, perhaps to some extent, the settling of large numbers of Chinese workers, managers, investors and business people into various African countries within the last decade. which burst its bounds and became the Zuyder Zee. of the Scheld, perhaps even to the mouth of the Somme. of Europe it is perhaps easier to point out than to define. as the land of the continental Angles, Saxons, and Jutes. various dialects of the Low-Dutch tongue are spoken. There has been a long, divided argument on how much influence that means and this is a huge mess since pretty much any opinion will contradict a lot of sacred ideas about the arrival of Christianity and our saints and so on. Some people have favored just occasional Saxon traders, some people have favored the idea of invaders / migrants similar to what went on in the south which would be very consistent with some old villages having “German” male names. 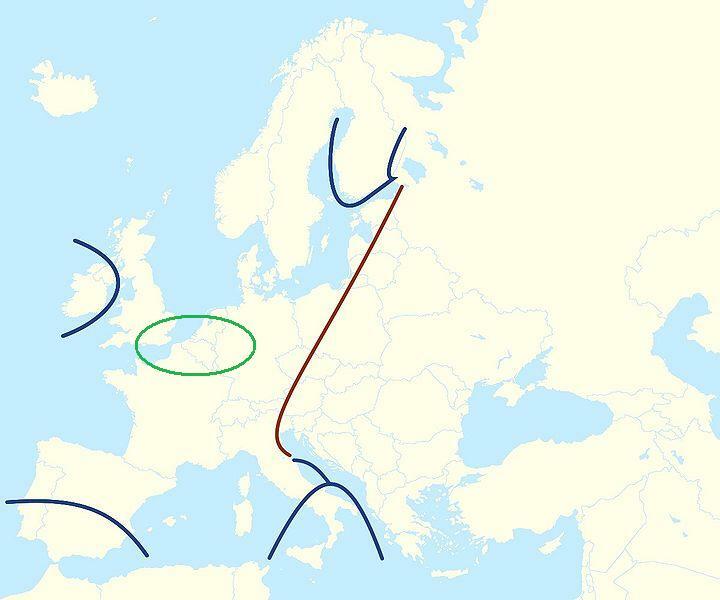 It would be a very good fit with this Hajnal business if Finland received some of these German migrations with the migrants running into problem that in the harsher climate their manorialism didn’t work very well, leaving Finland with family organization that doesn’t fit well into the Hajnal categories and makes a cline of fitting the Western European better the more southwest you go. It will be really interesting to see if we find enough old corpses to settle this debate with DNA since right now we can just speculate on uncertain identifications of place names and such. Lovely write up. The line extends northwards beginning with the German led Christianization of Sweden starting with the voyages to the north by the Saint Ansgar (8 September 801 – 3 February 865), also known as Saint Anschar, the Archbishop of Hamburg-Bremen. As Sweden was christianized German merchants and later burgers and artisans moved wholesale to the growing Swedish towns. German influence peaked in the mid 14th century (1364) when Albrecht von Mecklenburg made real his ambition to seize the Swedish crowns and thus became King Albert the 1st of Sweden. By this time there was a law stating that half of all burghers in Swedish towns would be Germans and the other half native Swedes. In 1392 the conflict flamed up into a race war in Stockholm when German burghers attacked and killed several Swedish burghers, after the Swedes in Sweden reacted negatively to the growing German dominance of Stockholm (the German mayor even had a private militia that is said to have driven over 300 Swedish burgher families out of Stockholm). Note that Stockholm was not the capital of Sweden at that time, merely the most important trading port. I have read somewhere that Swedes are closer genetically today with modern Germans than with either Danes or Norwegians. I suspect (just looking at names is enough) that a portion of Finnish cities must have been populated by ethnic Swedish-German burghers resettling further east. To this day almost all Swedish words relating to government, trade, commerce, crafts etc. are German in origin. Good article and yes the Ostsiedlung was of crucial to both late medieval (and modern) developments in the area. Although I agree it was a self-organizing trend over centuries it’s important to remember what it did *not* entail. It did not entail the replacement of existing populations (Slavic and Baltic) but rather an infusion of settlers in existing built up areas or creation of new cities. In that respect it resembles the Roman colonia more then the American West, German settlements in the middle of or surrounded by Slavic/Baltic settlements). Just how democracy loving are Germans? Let’s don’t exaggerate things. Germans are way more respectful/subordinate to authority and old methods of doing things than Anglo-Saxons. See what happened to the Second World War.